Small-scale slash and burn agriculture on forest edge in Mai Ndombe region, DRC. As forests shrink, wildlife disappears and economies sputter, one business keeps booming in the Congo Basin forests: logging. Along with pressures caused by population growth over the last decades, unregulated and often illegal extraction of timber puts wildlife, local people and economies at risk. But there’s a more serious factor affecting the prospects of the Congo Basin forests: unrelenting timber demand from around the world. China, Europe and the US are importing vast quantities of wood products from the forests of Gabon and Cameroon. These are powerful incentives for the continued extraction of wood from the Congo Basin forests. Activities such as agriculture, logging, bushmeat hunting and mineral and oil extraction have direct impacts on forests and wildlife. Population growth, conflict and disease, governance problems, lack of forest management capacity, a shortage of funding and a lack of awareness are some of the factors that worsen these issues. A growing problem has been road-building by logging companies, which gives bushmeat hunters access to the heart of previously remote forests. This has led to extreme over-hunting of vulnerable species such as the western lowland gorilla, elephant and leopard. The chimpanzee, recently shown to be the potential source of the HIV 1 virus in humans, is also endangered. 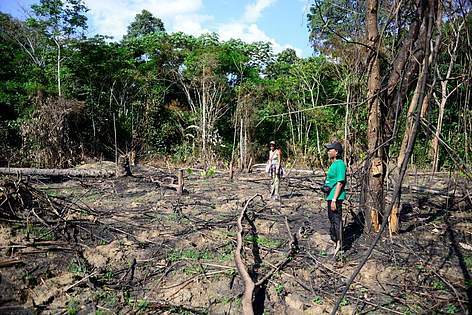 Its forest home is being logged and it continues to be hunted and sold as food in and around the Congo Basin forests. With human populations growing at 2% to 3% and subsistence agriculture still the main source of food and income for most people in the Congo River Basin, habitat loss, bushmeat trade and climate change are likely to be the most significant long-term threats to biodiversity. Continuing global demand for the timber resources of the region's forests will also make conservation efforts particularly challenging. To understand the situation in today’s Congo River Basin, one must go back in time to the era of foreign colonization. When the region’s countries gained their independence, the colonial powers in Central Africa left an unstable and flawed foundation upon which to build modern states. Economic structures favoured foreign investment, particularly in the extractive industry, and little had been achieved to empower and build the capacity of citizens. Today, environmental issues are just one of the items on the ‘to-do’ list of several Congo River Basin countries. Better education and infrastructure, employment opportunities, improved public services, more foreign investments are some of the many priorities vying for support. Clearly, environmental concerns need to be well integrated in all of these areas if they are to be successful. 1Cleaver et al. 1992. Conservation of West and Central African Rainforests. The World Bank Environment Paper Number 1, in cooperation with IUCN. Washington DC. 2 CARPE. 2001. Central Africa and Forest Governance Counter-Balancing the Powers of Public and Private Sectors. Congo River Basin Information Series. Issue Brief #11.